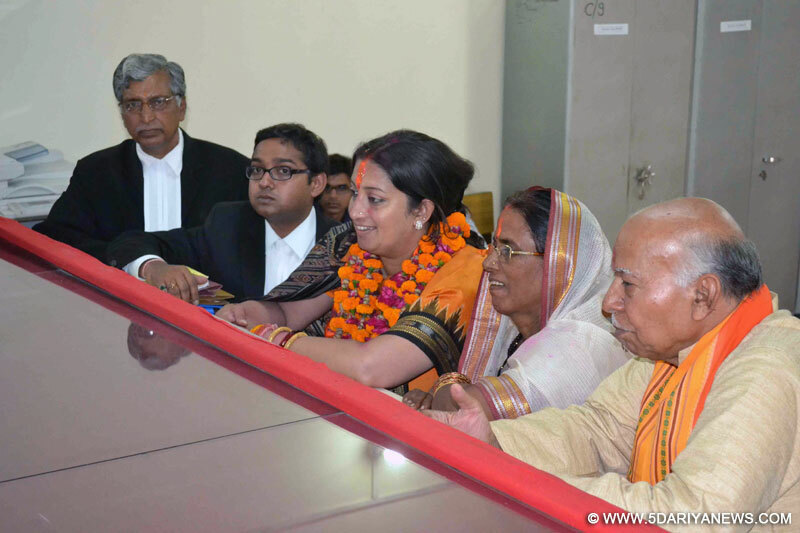 BJP candidate for 2014 Lok Sabha Election from Amethi, Smriti Irani files her nomination papers in Amethi on April 16, 2014. Smriti Irani, the BJP candidate from Amethi, Wednesday filed her nomination papers for the Lok Sabha polls.The TV actress-turned-politician also held a road show before filing her papers at Gauriganj district headquarters.She prayed at a local temple and held a hawan before proceeding to file her papers. Talking to reporters, she said Congress vice president Rahul Gandhi was in for a tough contest as people were no longer enamoured by the Gandhi family tag and instead wanted development.Asked about the contest she will face against Aam Aadmi Party candidate Kumar Vishwas, she said she was in the high profile seat to take on the "real Congress and not its B-team".Amethi goes to polls May 7. Gandhi is the sitting member and is seeking a third term. Smriti Irani BJP's key face to take on opposition?